In spite of careful monitoring of contents, we do not assume any liability for the contents of external links. The content of external websites is the exclusive responsibility of their operators. 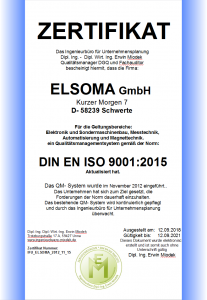 Elektronik & Sondermaschinen GmbH, Schwerte reserves the right to change and/or update the information and content of the Internet appearance at any time and without prior notification. We also point out that the information on this page may contain technical inaccuracies or typographical errors. We kindly ask you not to send us any confidential information or copyright protected information via this website. Please note that we will treat any information or any material which reaches us in this way as not confidential. Should you nevertheless send us confidential information or material, you thus grant Elektronik & Sondermaschinen GmbH, Schwerte an unrestricted, irrevocable right to use, reproduce, present, execute, modify, pass on and/or distribute the relevant confidential information or material. Elektronik & Sondermaschinen GmbH does not assume any liability for errors in the content of this Internet appearance or any damage caused by the Internet appearance. All information contained in this Internet appearance related to our products merely serves to describe the products and are not legally binding; in particular it does not substantiate a procurement guarantee according to the law. All rights remain reserved. Layout, design, logos, texts, graphics and photographs in this Internet appearance are copyright protected.